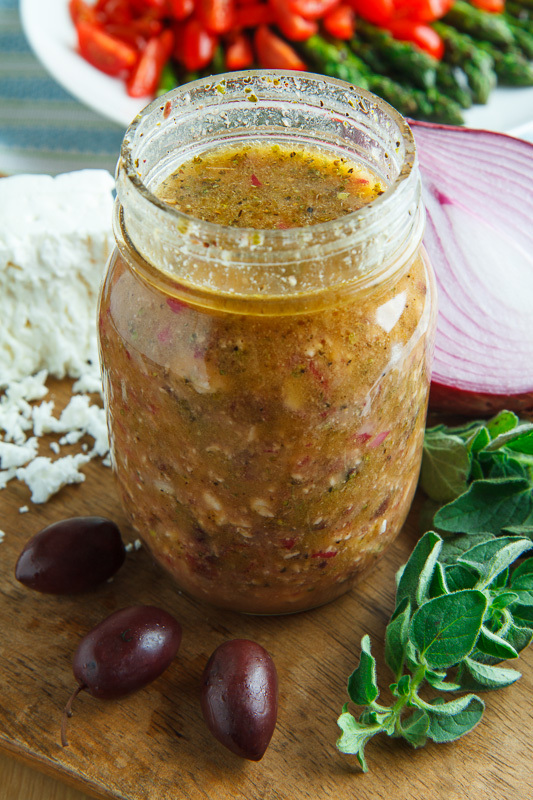 A tasty Mediterranean themed dressing with kalamata olives and feta along with red onion, honey and oregano. Here is my new favourite salad dressing, a kalamata olive and feta vinaigrette that is sure to make any salad pop! This dressing is based on some of my favourite Greek and Mediterranean flavours with the kalamata olives and feta being the stars of the show. The base of the dressing is extra virgin olive oil and red wine vinegar and the accompanying flavours include tangy red onion, garlic, honey to add a touch of sweetness and oregano. In addition to being great ad a salad dressing you can also toss grilled or roasted veggies in it and turn them from ordinary to extraordinary! Option: Omit feta for dairy free. This dressing would drive anyone to consume salad like candy! Really like your site, but you have sooooooo many ads and advertising on it. Very distracting. It looks delicious. Is the oregano dry or fresh for the 1 tbsp amount? Unknown: That is 1 teaspoon dried oregano; go with 2 teaspoons of fresh. Just made this.. and it is fantastic! Chelsea Scott: I'm glad that you enjoyed it! Had a salad at Charley's steakhouse in Tampa that had olive vinaigrette and it was love at first bite. This looks yummy. Will be making it today. How long does it keep in refrigerator? Thank you! sungvars: This will keep in the fridge for a week or more. Enjoy! There are more "food" ingredients (about 11-12 tbsp) than liquid. (6 tbsp) and yet Your picture shows a very pourable dressing. Just confirming the amounts are correct? I've been stung by many recipes on Pinterest and hate wasting money. Lorrie Tannahill: This dressing is actually pretty chunky as seen in the linked Grilled Asparagus and Tomatoes in a Kalamata Olive and Feta Vinaigrette with 8 tablespoons liquids and 8 tablespoons solids. If you want a more liquid/pourable dressing, make sure to use a fine chop for the solid ingredients or pulse everything in a food processor and/or add 2 tablespoons of both vinegar and oil. Enjoy! My family has been enjoying your Creammy Feta & Dill Dressing with our salads. Now gota try this delicious looking dressing also. I just love all your rercipes with your special touch. This dressing is just plain…..YUMMY! Love this take on Greek salad dressing. I tried this 2 ways: as written over a salad of fresh tomatoes, cucumbers, red onions…so good. Then to the remainder of the dressing, I added a small amount of water to thin the dressing and used over the same ingredients tossed into a romaine salad with grilled chicken. Adding water (like 1 tablespoon) doesn’t dilute the taste and is an old dieters trick I use frequently when reducing the amount of oil in a salad dressing. So for anyone thinking this vinaigrette is too thick, try the water trick. Super good recipe…and your site looks amazing!